This wine cooler is stunning and a beautiful gift, order for £60. Not confident in your artisitic ability ? 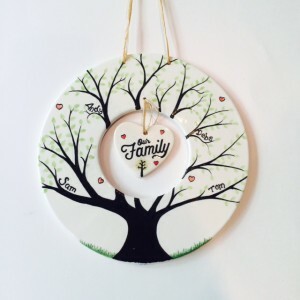 We can take your idea and turn it into a bespoke creation, we can offer wedding gifts, christening gifts, milestone birthday gifts and lots more, you think it up, we can create it ! 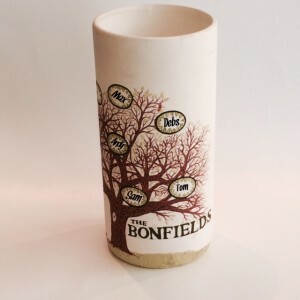 We can also offer a lovely service for creating memorable gifts, we can take a piece of pottery to a school, workplace, club etc and take a fingerprint from each child, we then bring back to the shop and turn it into a lovely keepsake…. A fab gift for a teacher, a colleague or a friend. Our signature plates are really popular, a fab gift for weddings, parties, christenings, you take a piece of pottery to your event, everyone writes a little message in pencil, you return to us to do our magic and receive a lifelong memory of a fab celebration. For any of the above, please contact the shop to chat through ideas and costings.